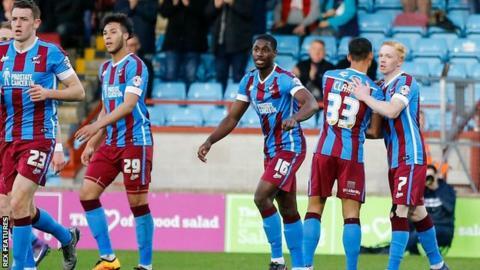 Scunthorpe moved within four points of a League One play-off spot following victory over Bury at Glanford Park. Luke Williams broke the deadlock for the Iron from the edge of the box before Danny Mayor's long-range strike went just wide for Bury. Kyle Wootton doubled the home side's advantage at the far post after good work from Paddy Madden, before Tom Pope's header halved the deficit. Bury's Kelvin Etuhu was sent off in stoppage time after a second booking. Scunthorpe have won three games in a row and lie 10th in the table. Match ends, Scunthorpe United 2, Bury 1. Second Half ends, Scunthorpe United 2, Bury 1. Stephen Dawson (Scunthorpe United) wins a free kick on the left wing. Foul by Reece Brown (Bury). Cian Bolger (Bury) is shown the yellow card for a bad foul. Hakeeb Adelakun (Scunthorpe United) wins a free kick in the attacking half. Foul by Cian Bolger (Bury). Second yellow card to Kelvin Etuhu (Bury) for a bad foul. Foul by Kelvin Etuhu (Bury). Attempt saved. Peter Clarke (Bury) header from the left side of the box is saved in the top centre of the goal. Corner, Bury. Conceded by Murray Wallace. Kelvin Etuhu (Bury) is shown the yellow card. Neal Bishop (Scunthorpe United) is shown the yellow card. Sean Clare (Bury) wins a free kick on the left wing. Stephen Dawson (Scunthorpe United) wins a free kick in the attacking half. Corner, Scunthorpe United. Conceded by Peter Clarke. Attempt blocked. Hakeeb Adelakun (Scunthorpe United) right footed shot from the right side of the box is blocked. Reece Brown (Bury) wins a free kick in the attacking half. Corner, Scunthorpe United. Conceded by Danny Mayor. Corner, Scunthorpe United. Conceded by Kelvin Etuhu. Attempt blocked. Paddy Madden (Scunthorpe United) right footed shot from outside the box is blocked. Substitution, Scunthorpe United. Jack King replaces Kyle Wootton. Attempt saved. Leon Clarke (Bury) header from the centre of the box is saved in the top centre of the goal. Substitution, Bury. Reece Brown replaces Tom Soares. Attempt missed. Leon Clarke (Bury) header from the centre of the box misses to the right following a corner. Corner, Bury. Conceded by Luke Daniels. Attempt saved. Danny Mayor (Bury) right footed shot from the centre of the box is saved in the bottom right corner. Corner, Scunthorpe United. Conceded by Chris Neal. Attempt saved. Paddy Madden (Scunthorpe United) right footed shot from outside the box is saved in the top centre of the goal. Attempt saved. Hakeeb Adelakun (Scunthorpe United) right footed shot from outside the box is saved in the top centre of the goal.